This guide shows how to set up a Google Kubernetes Engine cluster with Cloud Run on GKE enabled. Because you can use either the GCP Console or the gcloud command line, the instructions cover both of these. Note that enabling Cloud Run on GKE installs Istio and Knative Serving into the cluster to connect and manage your stateless workloads. Note: This guide assumes you are using a Mac or Linux operating system. If you are using Microsoft Windows, you may need to adjust the command lines. Although you can use either the GCP Console console or the gcloud command line to use Cloud Run on GKE, you must use the gcloud command line for certain tasks, such as setting up outbound networking. Replace [PROJECT-ID] with the project ID of the project you created. Replace [NAMESPACE] with the Namespace you want to create. Replace [CLUSTER] and [CLUSTER_LOCATION] with the name and location of the cluster you are using. These are the minimum settings. Note that Kubernetes version 1.11.7-gke.6 (or later) is required. You can use either the gcloud command line or the console to create a cluster. Click the appropriate tab for instructions. Click Create cluster to open the Create a Kubernetes cluster page. Enter the name you want for your cluster. Choose either Zonal or regional for the location type: either will work with Cloud Run on GKE. Zonal clusters are less expensive, but will incur downtime during master upgrades. Select a zone or region for the cluster, depending on your choice in the previous step. Choose a zone or region close to you, or use us-central1-a. From the dropdown list, select the Master version for your cluster. You must use version 1.11.8-gke.4 or newer. Other recommended versions are listed below. For Machine type select 4 vCPUs. In the Node pool form, click More node pool options to expand the form. These instructions don't enable cluster autoscaling, so leave the checkbox Enable autoscaling unchecked. 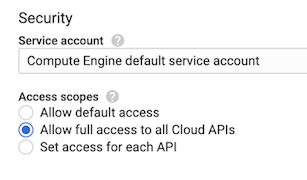 Note that even if you don't enable autoscaling of the cluster size, Cloud Run on GKE will always autoscale instances of your services within the cluster. Select Enable Stackdriver Logging service. Select the Enable Istio (beta) checkbox. Set Enable mTLS to Permissive. Note that you must select Stackdriver Monitoring and Logging in order to create the cluster. Click Create to create and provision the cluster with the configuration you just completed. It may take a few moments for this process to finish. [CLUSTER_NAME] with the name you want for your cluster. [ZONE] with the zone you are using for your cluster, for example, us-central1-a. Note that the cluster won't be created unless you use the parameter --enable-stackdriver-kubernetes as shown. Note that although these instructions don't enable cluster autoscaling to resize clusters for demand, Cloud Run on GKE automatically scales instances within the cluster. Replace [CLUSTER_NAME] with the name you used for your cluster, and if necessary replace us-central1-a with the supported cluster location of your choice. Important: Running a GKE configuration like the one described in this page can be costly. GKE is billed differently than Cloud Run, so you will be billed for each node in your cluster, even if you have no services deployed to them. To avoid charges, you should delete your cluster or scale the number of the nodes in the cluster to zero if you are not using it. By default all outbound traffic is blocked for the cluster (including access to Google APIs). To enable all outbound network access, for example to connect to GCP services such as Cloud Storage or external APIs, you need to set the correct scope of the proxy IP range by editing the config-network map. You'll need to use the gcloud command line (see setting up gcloud and kubectl command-line tools. Note: The follow operation enables outbound traffic to all IP addresses on the internet. This allows your applications to connect to potentially untrusted endpoints. To set the correct scope, you need to determine the current IP ranges of your cluster. The scope varies depending on your cluster configuration. Replace [CLUSTER_NAME] with your cluster name. Note that you must supply the cluster name even if you have set it as the default cluster for gcloud. Note also, that if you haven't set your default zone as shown in the prerequisites section, you must also supply the zone parameter after the cluster name: --zone=[ZONE], replacing [ZONE] with your cluster's zone. You must append these IP ranges together to enable all outbound access, as described in the next section. When you set the parameter to a valid set of IP address ranges, Istio will no longer intercept traffic that is going to the IP addresses outside the provided ranges, and you don't need to specify any egress rules. If you omit the istio.sidecar.includeOutboundIPRanges parameter or set it to '', the value of the global.proxy.includeIPRanges parameter provided at Istio deployment time will be used: this value is *. Note that if an invalid value is used, '' will be used instead. Save your changes. Note that any change is automatically picked up and used for all deployed revisions. Replace the host URL and IP address with your own URL and the cluster's IP address. If you don't know how to locate the cluster's IP address, see the instructions in Accessing your deployed service. From the output of the get pods command, locate the pod associated with your service: it will start with the name of your service. Use that pod name in the following command to retrieve the metadata and see the labels applied. Replace [POD_NAME] with your pod name. See the pod documentation for more information on pods. The line starting with traffic.sidecar.istio.io/includeOutboundIPRanges: 10.16.0.0/14,10.19.240.0/20 has the most important information. If you want to use custom domains, see Mapping custom domains. During the beta, Cloud Run on GKE cannot be disabled after you create a cluster with it enabled. You must delete the cluster to stop the Cloud Run on GKE components from running. Note that this permanently deletes workloads in the cluster and all other cluster states. You can use the console UI or the gcloud command line to delete clusters: select the tab for instructions. Select the cluster you want to delete. Replace [CLUSTER_NAME] with the name of the cluster you are deleting. When prompted to confirm the cluster deletion, respond y.